My Tampa Bay Mommy : Star Wars Force Friday Toys Unveiling - Where to Buy, Exclusives and More! Star Wars Force Friday Toys Unveiling - Where to Buy, Exclusives and More! It's #ForceFriday today, 9/4. What does that mean?!? Today is the release of merchandise inspired by the highly anticipated new movie Star Wars: The Force Awakens. This global launch happened at over 3,000 retail locations in the U.S., as they opened their doors at midnight for fans to be among the first to discover the new products. You can visit the 18+hour global unboxing event on YouTube where highlights of the new product range were officially unveiled. 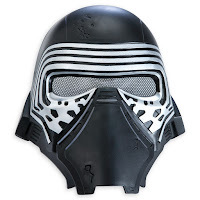 Star Wars: The Force Awakens Voice Changing Masks exclusive to Disney Store. The Disney Store also has 2 for $40 Star Wars T-shirts until 9/9. Beyond lightsabers, construction sets, figures and collectibles, fans can find products across a wide variety of categories, including apparel for all members of the family, home décor, lifestyle accessories, books and more. These new Star Wars products can be found around the world at mass and specialty retailers, such as Amazon.com, Kohl's, Target, Toys "R" Us and Walmart as well. Target has coupons to stack with the toy release. Spend $50, Get $10 off or spend $100 and save $25 off! Use the promo code: FORCE at checkout online or text FORCE or FORCE25 to Target and get the coupons on your mobile phone to use in-store. Don't forget to use your RedCard and save another 5%. A Star Wars collection of Rock & Republic® misses apparel and Mighty Fine juniors apparel offers female fans graphic tees, leggings, sweatshirts, hoodies and dresses available at Kohl's. Use the code: COOKOUT10 and get $10 off a $30 or more purchase thru 9/7! This makes some great deals to be had. Not to mention, you will earn $10 in Kohl's Cash for every $50 spent thru 9/7 as well. The ultimate Millennium Falcon children's bed from Pottery Barn Kids, looking like something seen from a galaxy far, far away.